There are three jobs available to an Elf. You can make shoes at night while an old cobbler sleeps…but it’s not exactly the most rewarding work. You can bake cookies in a tree. But it’s dangerous having an oven in an oak during dry season… But the third job. Well, the third job makes being an Elf worthwhile. Some call it “the show” or the “big dance”. It’s the profession every Elf aspires to. And that’s to build toys in Santa’s workshop, and run races… spreading Christmas cheer. * optional: green running shoes and lightning bolt shwings, black belt with gold buckle & gold buttons. While they aren’t necessary, the extra details can be the “icing on the cake.” & We’re pretty sure that the shwings are the secret to the “Elves” magic. 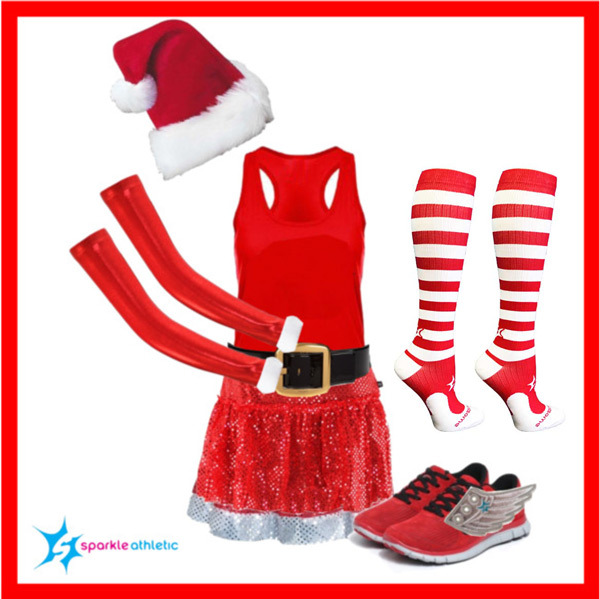 Assembling your Santa’s Elf running costume is pretty self-explanatory. If you’re worried about it being too cold, swap the tank top for a long-sleeved shirt, and add some red or green running capris or tights!